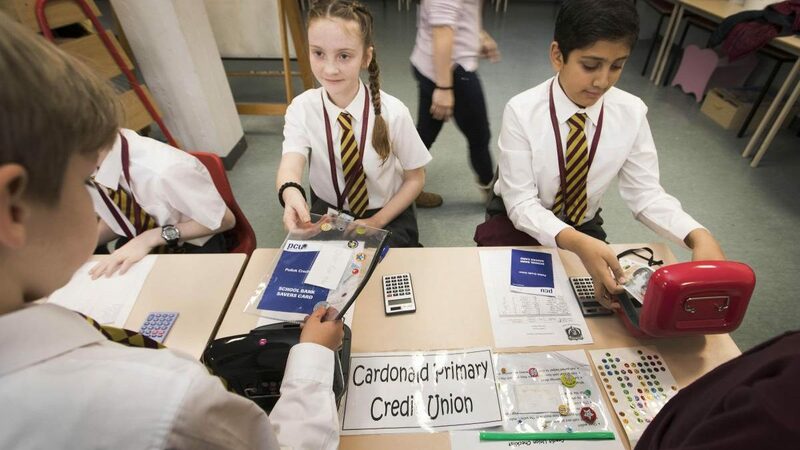 Pupils at a Glasgow primary school where pupils have saved more than £45,000 in their credit union accounts. At the Scottish Parliament elections in 2016 we promoted the idea developed by the Co-operative Party-led Glasgow City Council that all pupils in First Year at Secondary School should have a Credit Union account opened for them and that there should be money deposited in that account as a starter towards the good habit of saving with an ethical provider. We believe that this a practical way of protecting people from legal and illegal loan sharks and of promoting financial co-operatives like credit unions. This is why we are delighted that Scottish Labour leader Richard Leonard MSP has demonstrated his commitment to co-operative principles by putting forward a policy which will implement our ideas about credit unions right across Scotland. Glasgow’s initial idea was a ‘starter for 10’ with £10 being deposited in First Year pupils Credit Union accounts, it is great to see that Richard Leonard is now proposing a ‘starter for 20’ with £20 now being deposited in these accounts. Scotland’s broken economy doesn’t work for working people, with too many families having to turn to high cost credit to pay essential bills. That cannot go on. Under Labour, the days of predatory companies profiting from the squeezed wages of working people will end. Labour will take real action on the cost of living to ensure more money in the pockets of working people. But I also want to see generational change in attitudes towards how people access credit if they need it. That’s why a Scottish Labour government would expand support for credit unions and establish a credit union account for every first year pupil in Scotland – we’ll put £20 in it too. This will increase awareness of credit unions among working class families and ensure that generations of young people to come have access to low cost credit. It is great to see the importance of credit unions recognised and also to see Scottish Co-operative Party policies being promoted by Richard Leonard.